A lavish look at the art of Taroni’s silk and fashion textiles, which have been found in the haute couture fashions of the world’s leading designers, from Dior to Schiaparelli. This book was created with eight different colored covers with silk finishing. Customers will be shipped any of the eight different colors at random. 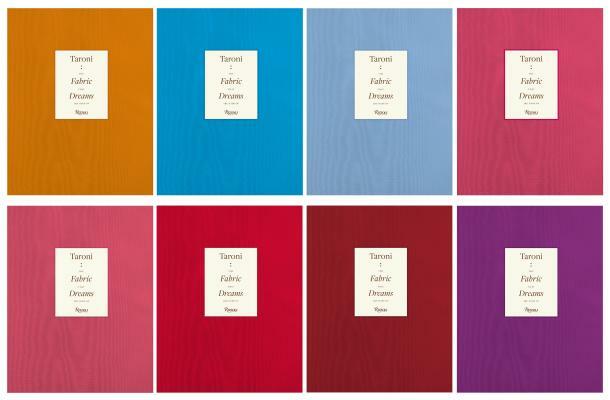 A book about fashion, this volume tells the story of the elegant luxury fabrics of Taroni, who since 1880 have produced fabrics of the highest quality, combining craftsmanship, technology, creativity, and experimentation along the way. A detailed account of the company’s history is accompanied by lush images as well as interviews and texts from leading creative figures such as Gianfranco Ferré, Roberto Capucci, Alber Elbaz, and other top fashion designers who have worked with Taroni. A virtuous example of Made in Italy where the synergy between technical research and creative work leads to excellent results exported all over the world. Margherita Rosina is an expert on both early and contemporary textiles, with a focus on the 1900s and the growing fashion industry; she has held the post of director of Museo Studio del Tessuto della Fondazione Antonio Ratti, Cernobbio. Enrica Morini teaches Contemporary Fashion at the IULM University (Milan). She has curated exhibitions for and collaborated with the Fondazione Gianfranco Ferré and Fondazione Ratti.